Suri and Katie exciting a dance studio in Los Angeles on Wednesday, 28. Suri is finally OUT, after a whole month of hiding!!!!! Suri Cruise is only three, but she's so keen to follow in the footsteps of her thespian parents she has already started having private lessons. "Suri loves her dance classes so much that when she started asking her mom to act, Katie couldn't say no," a source told Britain’s Star magazine. The idea to have lessons was Suri's, although Tom Cruise has previously admitted he would be happy for his daughter to become an actress. "I'd love it. I'd love it! Acting is... a great life, to get to entertain people and create characters and stories," he said. Tom, 47, and Katie Holmes, 31, are thought to have spent over a million dollars since she was born providing her with everything she needs in life, including weekly French and Spanish lessons and regular tap-dancing classes. 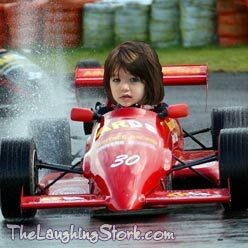 Suri was even given her own $30,000 replica race car to cruise around the neighborhood in, after she became obsessed with watching motor racing on TV. Katie Holmes was spotted at the screening of “The Extra Man” as part of the Sundance Film Festival last night, on January 25. NO Suri! :( She is probably staying home with Tom in LA, while he is re-shooting some stunts for "Knight & Day". "The Extra Man" is premiering today on Sundance Film Festival in Park City, Utah. "The Romantics" will premiere on Wednesday, January 27th. Katie is OUT! but NO Suri! AND its a first time i see Katie driving HERSELF! 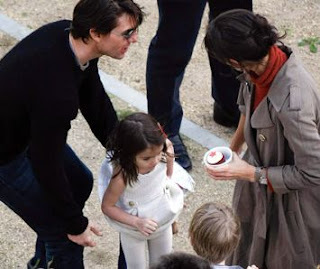 Suri wore this White Wool Glimmer Dress by Juicy Couture, while out in Melbourne on August 11th 2009. There was a lot of speculation about this dress - initially i thought it was from Floriane..
and than Mandee suggested it is from Lucy Sykes..
..but both dresses came only in Black. Suri is featured in "Celebs Who Have Rocked The Color Red" in JustJared.com’s weekly “Just 10″ list. 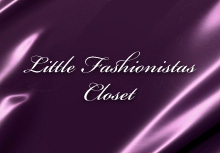 - Katie Holmes and Suri Cruise brought some major glamour to Boston by wearing matching Holmes & Yang dresses! NOTE: yep, the last Suri sighting was on January 6th, and while we are impatiently waiting, iam posting all the stuff about Suri i come across on the web. After taking home the best TV musical or comedy honor at the 2010 Golden Globe Awards, Glee's Jane Lynch thanks Suri Cruise for being a fan of the show. With Suri Cruise being one of the most fashionable Hollywood kids around, it's easy to assume that mom Katie Holmes is the one doing the styling. Turns out three-year-old Suri does quite well on her own, thank you very much. 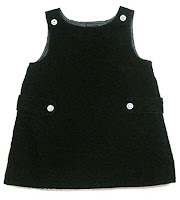 "Just so you know, she dresses herself," Tom said. "She really does. She picks out everything on her own." Katie added, "She really does. She has such cute style." Like a proud papa, Tom says he doesn't "care one single bit" how popular Suri is with us folks here at Eonline—even if it means she upstages mom and dad. "I love it," he said. "I think that's great. How can you not love her? She's wonderful. I really appreciate that. She's a joy." As for Suri going into show business, Tom said, "We want her to do whatever makes her happy. She can decide on her own." *pictured above - Tom & Katie attending the hottest Pre-Golden Globe party in Los Angeles Friday Night at the Chateau Marmont Hotel on January 15. Katie Holmes‘ “Don’t Be Afraid of the Dark” co-star Bailee Madison was interviewed about the movie and they asked her what Katie and Suri Cruise are really like. you can watch the full interview video here. since its very slow on Suri news, i went back and updated many posts from 2007 and earlier. - unseen picture added to post of December 4th 2007 - Suri & her parents shopping in London. Suri is wearing Pink Paulina Dress by Lilly Pulitzer dress. 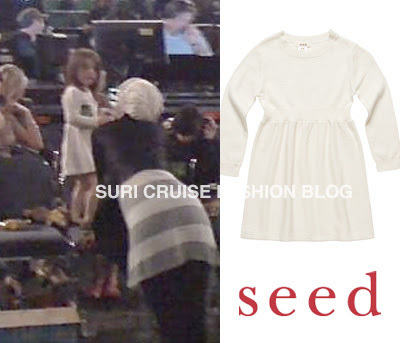 Suri wore this Fine Knit Dress in Vanilla from FW'09 collection by SEED, while attending Beyonce's Concert in Melbourne on September 15th 2009. 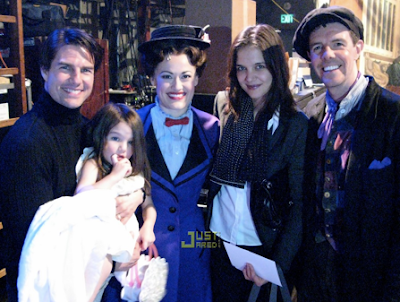 Suri and her parents spent an evening out at the Ahmanson Theatre to see the LA engagement of hot musical Mary Poppins, on Wednesday, 6. This is the second time Suri has seen the world’s most famous nanny on stage. Katie brought her to see the Broadway production in August 2008 during NY rehearsals for her own Broadway debut in Arthur Miller’s All My Sons. unfortunately, out of this single picture we have so far from that evening, its hard to tell what Suri is wearing, apparently its a short-sleeves dress.. and she is holding her favorite Seashell purse.